I finally have a finish! This little quilt was made from some leftover charm scraps from this quilt I made last summer. And look at the fun fabric I put on the back. Picked up a yard of this in Paducah a few years ago, I knew at some point I would have a small quilt it would look good on! Wonderful pieces, love the antique look they have. That's a sweet little quilt! Love the backing fabric.....perfect! I love the front and the back! So cool!! A fantastic finish! I really love the look. The quilting is superb. Really dig that, too. 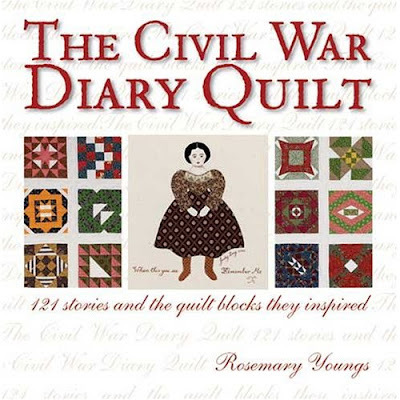 cute coin quilt and what a great signature quilt! 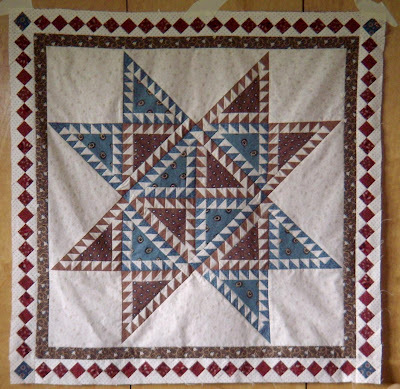 I used the cheater panel fabric you made the quilt from into pillowcases and they look great and old fashioned. Just an idea. 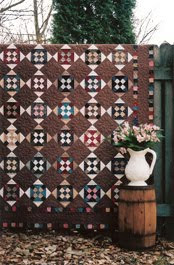 Love the look of a antique quilt! These are treasures! Congratulations on the fabulous finish! Some beautiful work. I particularly noticed the cheater cloth. Wow. What company produced that?